Anaya Extra Añejo proves some things are worth the wait. Three years in the barrel creates a tequila that ensnares the senses. A hint of smoky sweetness to tantalize the nose. Dark and rich, Anaya Extra Añejo offers veritable symphony of flavors, ensuring no two people experience it the same way. Some taste the teasing tango of chocolate and agave, while others experience a samba of smoky oak. A smooth whiskey finish offers the loving embrace of cozy chairs and lush smoking jackets. And yet Extra Añejo never loses the pure agave flavor that makes it so delightful in the first place. Smoky flavor, whiskey-sweet finish that lingers. Hints of chocolate and oak. When we create our Extra Añejo, patience is the name of the game. Six to fourteen years to grow agave to perfection. Harvested by hand and slow roasted for 54 hours. Distilled with painstaking perfection, then transferred into Jack Daniel’s barrels from the heart of Tennessee, where it ages for years, eagerly pulling every drop of taste from the confines of its temporary home. But you don’t have to be patient. You can enjoy this ultra-bold tequila whenever you want. Let it stand on its own; Extra Añejo has a big personality, and is wasted on mixed drinks. Share a shot or savor by sips. Drink it neat, at room temperature—never dilute with ice! 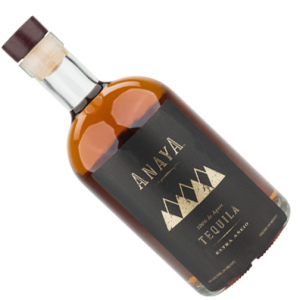 Enjoying Anaya Extra Añejo is all about the journey: discovering flavor notes both high and low, reveling in a sea of scintillating delights. It draws many into its dance, from the tequila perfectionist to the whiskey enthusiast. Those who love complex flavors. Tequila purists who adore bold tastes. Whiskey drinkers who want to expand their options.